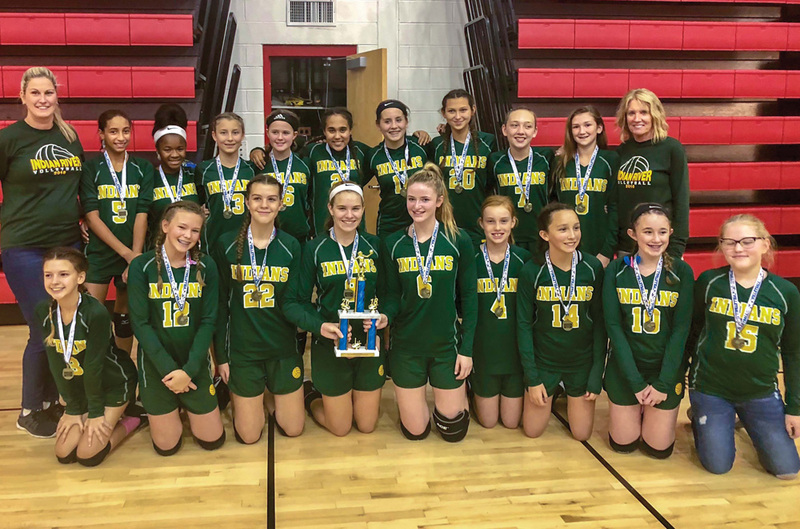 The SMS volleyball team went undefeated on the year and earned the state championship title. They finished the season 9-0 in their regular-season matches. They went 3-0 at the DAAD Middle School Volleyball State Invitational Tournament. They never dropped a set. Not one. None. Zero. Zilch. Nada. Their closest set during any of their matches in the regular season was a 25-21 score against Beacon. In the state invitational tournament, their efforts and record in the regular season to that point earned them a seed in the top bracket against many similar teams with unbeaten marks. And if it isn’t obvious by now, “they” would be the Selbyville Middle School girls’ volleyball team. Their 2018 campaign was one for the record books, and one that will be looked back on in future years as quite possibly the greatest group of girls to hit the court at Selbyville. In their first match of states, SMS defeated Fifer, 2-0 (25-14, 25-13). Camryn Ehlers had 15 kills, 7 service points and 5 aces. Grace Fiorilla (6 aces) and Leilani Ehlers (5 aces) each had 9 service points, while Scarlett Dunn chipped in with 7 service points, 2 aces and 4 kills. Lily Hoban added 3 service points, and Mya MacDonald had 4 kills. SMS cruised to its second win of the day with another 2-0 sweep (25-15, 25-17), over Caravel. Again it was Camryn Ehlers leading the way, with 9 service points, 7 kills and 3 aces. MacDonald had 4 kills and 4 service points. Fiorilla had 9 service points and 2 aces, while Leilani Ehlers contributed 5 aces, and Dunn added 5 service points. In the finals, the Indians faced their toughest test of the season, but passed with flying colors thanks to a 2-0 win over H.B. DuPont. The sweep came with set scores of 26-24 and 25-17. Camryn Ehlers had 10 service points, 8 kills and 6 aces. Hoban came up big with 10 service points, 5 aces and 2 kills. Fiorilla filled up the stat sheet with 5 service points, 5 kills and 4 aces. Members of the Selbyville squad included eighth-graders Aniyah Blake, Scarlett Dunn, Camryn Ehlers, Madison Geppi, Lily Hoban and Mya MacDonald. Seventh-graders on the team were Taylor Conaway, Brynn Crandell, Grace Fiorilla, Marissa Layton, Alise Tyre, Emelia Welch and Jade Wilins. The sixth-grade team members included Leilani Ehlers, Gracie Hoban, Isabella Snow, Anna Wiest and Jessica Zimmerman. Craig was assisted by Lisa Stetler, Tanya Ehlers and Croal.